There is a classical argument against animal research that surfaced in a recent conversation with Robert C. Jones. It is a thought experiment that can be traced back to science fiction work in the 50s, although its exact origin is unknown. The Gorgons are an extremely advanced civilization only a few light years away from Earth. It is nearly impossible for humans to grasp the vast cognitive gap that separates our species. Suffice it to say, our most magnificent cities are to them as ant mounds are to us. Our artistic masterpieces are to their sophisticated senses as dull and mundane as a blank wall is to our eyes. They consider our greatest achievements in mathematics and physics nothing more than child’s play. The Gorgons also have a deep scientific interest in learning about the nature of the Universe. It is not surprising that, upon landing on Earth, they debate the use of humans in harmful invasive experiments as a means to learn more about aspects of galactic biology. Would such experiments be ethically permissible? What would a Gorgon think? In order to answer the question we need more information than a statement about the Gorgons’ intellectual superiority. Namely — Do the Gorgons have a moral society? Perhaps the Gorgons are like the Borg in the Star Trek series — a race of cybernetic organisms designed to adapt and efficiently assimilate any other civilization they encounter, but considerate enough to warn their victims that “resistance is futile”. An amoral, technologically advanced civilization (the Borg) attempts to assimilate humans. The Borg is capable of acquiring the technological knowledge of other civilizations, but incapable of absorbing any of their moral principles. 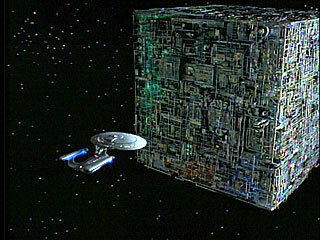 There is no doubt the Borg is highly intelligent and technologically advanced. There is also no doubt that the Borg is amoral. The Borg sees the assimilation of a civilization as neither right nor wrong — assimilation is simply what the Borg does. It is its nature. The same is true for a lion killing a gazelle. The lion has no concept of his killing being right or wrong — that’s just what lions do. If the Gorgons are an intellectually advanced but amoral civilization (like the Borg), then the question “What would a Gorgon think about harmful human experimentation?” is meaningless. Gorgons are simply unable to pose themselves such question and we cannot answer for them. What is certain is that if we were to run into amoral Gorgons the result would be the same as if we were to run into the Borg… or a hungry lion for that matter. Of course there is another possibility. The Gorgons may happen to be a race with moral principles. In this case, one may argue the inferior intellectual capacities of our species would not be as important to them as the fact that we are share basic moral principles, such as the golden rule. This is a natural outcome in many fictional encounters with other worlds we read about in the science fiction literature, where different versions of a “prime directive” are at work — a binding principle of non-interference by humans with other less developed cultures and civilizations. If mere humans can concoct such a prime directive, it is difficult to see how the more advanced, intelligent, rational and moral Gorgons would fail to reach the same conclusion. No; a moral Gorgon civilization would not experiment on a moral human species. But lets consider for completeness the remote possibility that the Gorgons will actually be a malevolent species and attack Earth in what develops to be an Independence Day scenario. Here, Bernard Williams, wrote there is only one question left to ask. *I thank Robert C. Jones for pointing out the science fiction story “To Serve Man” and the work of Bernard Williams and Hugh LaFollette on this topic. Posted on December 6, 2011 April 14, 2014 by darioringachPosted in Animal Rights News, NewsTagged ALF, aliens, animal liberation, animal research, animal rights, Ethics, moral philosophy, peta. I do not accept that intrinsic properties “is ALL that matters,” but there is hardly any school of philosophy that does not contain wisdom, and there is probably much I would find agreement with in moral individualism. The problem with philosophy (as well as religion and sometimes science) is the dogmatism. It is intrinsic to my heretical nature that as soon as any concept is elevated to the status of doctrine, I prefer to take exception to it. We agree then. We don’t accept that intrinsic properties it is all that matters… Indeed the tricky question is what else matters and how it should matter. It is not a trivial question at all (as Robert will readily point out) and I do not have well defined alternative. But this does not prevent one from rejecting individualism and, with it, the marginal case scenarios that cannot be formulated without it. My position would be somewhere in between yours, Dario, and Robert’s. My sense is that the remains of a human family member may possess some ineffable value that may stimulate a sense of reverence in friends or loved ones — and that reverence should be honored by others even if they consider the remains to be nothing but so many pounds of flesh. However, I feel the same about honoring the feelings of bereaved nonhumans (if they are of a species that appears to mourn the death of a conspecific) or the feelings of a human who is bereft over the death of a beloved nonhuman friend or companion. Trying to place an objective value on the remains of any dead individual enters the realm of religious speculation. The tenderness we feel towards those nearest and dearest to us forms the basis of the moral sense that we may apply to those more distant–hopefully in an “expanding circle” that comes to include all sentient beings. I always become attached to the animals that I come to know and especially to those who share or have shared my life, and that feeling of attachment extended into a concern for others of their species that I didn’t know and finally to all sentient beings (some species of which may be quite unlovable or even repulsive). I don’t love my companion animals in the same way I love my child, but it is a similar form of love, and if I were incapable of loving my child, I would certainly be incapable of loving animals as I do. Returning to the discussion of funerary rites, when one of my animals dies, I treat the body with some reverence and bury it in the woods with a stone on top of the mound. The deceased’s nonhuman companions in my home invariably appear to be disturbed by a death, with the intensity of the disturbance relative to the degree of relationship had with the deceased, and the relationship may not have been based on genetic similarity. Either you accept that intrinsic properties is ALL that matters or not. If not, we can discuss how to incorporate other characteristics and which ones these ought to be… and we might certainly differ there. But I think we agree that moral individualism must be rejected. Do we not? Pinker probably over-reaches in trying to apply his thesis globally. It is a good analysis of the decline in violence in the Western world. Pinker does address human-on-animal violence, and he tries to make a case that it is decreasing in relative numbers. He suggests that the increase in numbers of animals killed for meat in the US is due to a changing preference from red meat to white, with 200 chickens killed to get the same amount of meat as is provided by the death of one cow. Per capita meat consumption in the Western world has decreased, but it is skyrocketing in developing countries. Pinker is correct in saying that attitudes towards animals have improved dramatically since the 1970s, but this is true only in the US, Europe, Australia, and certain countries in Latin America. Canada is surprisingly backward in comparison, at least where wildlife is concerned. I say this as one who has spent a considerable amount of time on animal welfare efforts in Asia, Africa, and the Middle East. There are hopeful signs–particularly in Asia–but human population growth wipes out any gains. As you know, Dario, I (and Jeff McMahan and the late, great James Rachels) am a moral individualist. That’s one of the sources of our disagreements. As to Pinker, I think it’s an interesting thesis, but implicit in his thesis is the claim that *human-on-human* violence has decreased. But I would say that Pinker is (like most humans) speciesist here since the amount of human-on-animal violence has exploded in the last two centuries. 10 billion vertebrates a year in the US alone suffer nasty, brutish, and short lives only to be painfully executed for food. That’s a recent phenomenon in human history. Pinker’s thesis is plausible only if we discount animal suffering. As to the moral agency point, I agree that your notion is a good one (I said so above), I just question whether it is empirically factual. This is a science blog, right? Empirical facts are paramount, right? I’m just trying to be as scientifically reputable an empirical a philosopher as I can. And it’s not clear that rationality is an on/off phenomenon at all. Quite the contrary. As you point out, children have proto-ethics. But so do bonobos. And many other species. To write off these animal cases as mindless behaviors that result from natural selection begs the question about human exceptionalism. Lastly, I would welcome an entry on this blog about marginal cases. I think the claim that *all* humans are “in the club” is a dubious one. It’s one thing to claim that all moral agents are created equal and quite another to claim that all *humans* are created equal (morally). Both require argument. I’ve seen one for the former, but not the latter. Science may have something to say once the concepts under discussion are well defined. I offered a definition of moral agency. You felt it was too simplistic, and suggested instead that moral agency is largely based in rationality which you take is a graded phenomenon. But you have yet to define moral agency in terms of rationality in clear terms. So I am asking for a definition of moral agency in terms of rationality (and along with it a definition of rationality too). I will be glad to discuss the problems I see with moral individuality next week… Perhaps you can start by explaining Kim why in such a view we owe the same consideration to the remains of someone’s child as we do to any other inanimate object, such as a rock. (She seemed distressed by the thought). Dario, what distressed me about your reference re treating a dead child’s “remains with the same respect we treat a rock just because they are both inanimate objects” was that you implied that I had suggested such a thing, which I absolutely had not. Yours was a reference out of left field. Most bereaved persons (and some nonhumans, including extinct hominids such as Neanderthals) have an attachment to the bodies of loved ones, or close conspecifics, and have a psychological need to treat the bodies with some respect–at least during a period of grief. Funerals and death rituals are needed by the individuals who remain alive. But I have known people who have not had any attachment to the bodies of friends or family members once they are dead, and want them disposed of as expeditiously as possible. I find that a little chilling, but I would make no moral judgment about those person because of it. Some tribal people ceremoniously eat the bodies of dead loved ones, and I wouldn’t judge that either. I do hope that someone will enlighten me as to what funeral practices have to do with the moral agency and rationality of the bereaved or the deceased. Moral individualism holds that the individual is the proper object of moral concern. The only morally relevant properties are postulated to be those intrinsic to the individual. In our story, neither the rock nor human remains have interests of their own, nor a well-being to speak of. They are both inanimate objects with the same intrinsic properties and, a moral individualist must conclude they deserve equal moral consideration. On the other hand, you appreciate that the human remains deserve more consideration than the rock because their family members would suffer is something were to happen to them. Then, it seems to me, you must conclude there is something else besides intrinsic properties that is morally relevant and you have to reject moral individualism. Let me ask… can you also appreciate that humans can have an attachment to a mentally disabled human child in a way that they don’t to a chimp with the same intrinsic properties? Would that be morally wrong? A moral individualist, like Robert, would argue both deserve equal moral consideration and there is no ground to treat one differently than the other. Even if such attachment is real and the source of much suffering, Robert would argue we must fight such feelings and, instead, do what is morally correct in his view, treat the mentally disabled human child no different than the chimp. Robert — please correct me if my description is wrong. Well… I will have to blog on this study next week. When my son was in the terrible-twos, I realized that he was behaving just like a chimp nearing maturity. A chimp infant is like a human baby in all important aspects except appearance (which is why baby chimps are sought after by people as surrogate children), but as they become sexually mature, chimps become violent, unpredictable, and intractable just as two-year-old human children do as they enter the terrible-twos. The difference with a human toddler in the terrible-twos is that he comes out of it as a more rational and emotionally-controlled individual, whereas the chimp stays in a semblance of the terrible-twos for the remainder of his lifespan. It occurred to me then that child development psychologists might spend time observing the natural development and behavior of chimpanzees and possibly other primates for insights into the earliest phases of human childhood. What exactly are you trying to suggest with this quote? The fact that a human in his/her development to become a full moral agent may behave like an adult chimp at two years of age does not mean we owe these two individuals equal moral consideration. Similarly, the fact that someone’s child is dead does not mean we are now free to treat his/her remains with the same respect we treat a rock just because they are both inanimate objects. I am not a moral individualist. I do not understand how you could have inferred either of those two ideas from what I quoted from Pinker or what I wrote. I’m rather shocked by the sudden reference to a dead child’s remains. Robert suggested that moral agency is graded and then you seemed to support that with the Pinker passage about the similar behavior of a human toddler and an adult chimp. It is entirely possible I misunderstood the context of your quote. It would help if in addition to quoting a relevant passage you also say what exactly are you taken it to imply instead of leaving it up to the reader. I wish moral agency were so nice and clean. Perhaps it is conceptually clear in the way that you characterize it, but how about in reality? Further, for most philosophers, the issue of moral agency is closely connected with the issue of personhood. But I’ll come back to that in a minute. But in reality, is this really a threshold capacity? How about children? How about teenagers? How about 20 year-olds? Are these capacities like an on/off switch? As an empirical fact about human brains (which this is supposed to be), it’s dubious. “But this right [of parents over their children] is…not just a right against a person, since a child still belongs to his parents as what is theirs (is still in their possession like a thing and can be brought back even against his will into his parents’ possession from another’s possession). It is, instead, a right to a person akin to a thing. (MM 282). This passage suggests is that for Kant, rationality admits of degrees. If so (which seems right), and if rationality is antecedent to personhood and moral agency, then perhaps personhood, too, may turn out to be not a threshold phenomenon but rather a status that admits of degrees. And if children are not “things” but akin to things, then perhaps some nonhuman animals are as well, a significant moral outcome indeed. So, put simply, if personhood and moral agency are functions of cognitive capacities that involve the kinds of capacities that you suggest, and if these capacities are *rational* capacities, then if rational capacities admit of degrees (which seems right), then perhaps moral agency does as well and so the notion of “super” moral agents is not only not as incoherent as you might think, but is empirical fact. If we cannot come up with well defined concepts that are reasonably “nice and clean” then discussion may be difficult. I thought my definition of moral agency was essentially what Aristotle had in mind going back to the concept of moral responsibility. It was not my invention. A child that is not fully in control of, nor fully understands the consequences, of his actions, is not a moral agent. But even small children understand the concept of the golden rule. What appears to happen during development is that they develop the self-control to actually act by it. In any case, even if we accept some version where the concept is graded it doesn’t mean it is unbounded. You cannot argue that if you can impair humans to become quasi-moral agents that we must be open to the possibility of super-moral agents. It is like saying that temperature is graded and, therefore, we must be able to go below absolute zero. Once you understand the concept of moral agent and are in full control of your actions I don’t think how you can do better. I thought a moral agent was one that has a capacity to make voluntary, conscious decisions about his actions in a way that expresses a shared conception of what is good among a community of equals. If so, I do not see how this definition admits graded moral agency nor the notion of super-moral agents. Either you and your conspecifics can establish and clearly communicate a set of rules you would all be playing by, and voluntarily act to follow them, or not. Do you have in mind an alternate definition that would allow a graded notion of moral agency? If so, please share. I agreed with Kim that the desire to improve ourselves is not necessarily a symptom of self-hatred, but I also agree with Williams that it can be in a precursor to it and, moreover, degenerate into a hate for humanity. Those in the latter category want to improve mankind by eliminating it. Maybe I will leave this for an entire separate discussion as it continues to come up in our debates. I think we have enough with the above for now. First, by your own view, human marginal cases are not in the club. But I imagine they get in through some other mechanism. The “human family” I suppose. That’s dubious and certainly begs the question. To be consistent, human marginal cases should, on your view—under certain circumstances—be legitimate candidates for use as subjects in experiments, and in some cases, even before certain other primates. Second, this claim about cognitive properties being correlated to moral agency is an empirical claim, no? It’s a claim about things that go on in brains (or minds, if you prefer). What are these properties? I suppose things like the ability to contemplate your actions and behaviors and their effects and consequences on others; the ability to will yourself to alter your behavior if you think it the moral thing to do; the ability to empathize; the ability to abstract and universalize about moral acts. These are pretty advanced cognitive capacities, no doubt. But is there really a threshold here? Or might these kinds of things admit of degrees both in the abstract and—more importantly—in individual agents? If the latter (which seems plausible), then perhaps the Gorgons are what we would perceive as *super* moral agents, and to them, we are just proto-moral agents. Likewise, there is a ton of evidence that chimpanzees have a very sophisticated kind of proto-ethics, and the inference to the best explanation is not mindless Dennettesque behavior(-ism). Third, regarding Williams’s human self-hatred thing, that’s not an argument. It’s a preference he is expressing. And it’s a bit of an ad hominem. Criticizing humans for bad behavior *may* be a symptom of self-hatred, but it may also express a sincere desire to acknowledge mass and sometimes institutional injustice. Just because someone states that she believes that most human moral behavior saddens (or even sickens) them, or claims—as Kim does—that most humans function at a less-than acceptable moral level, does not mean that that person is self-hating. If you and Kim disagree, what you’re disagreeing about is an empirical fact about human psychology and moral behavior. Either humans are generally immoral or not. To respond to every criticism of human moral behavior as self-hatred is fallacious. Lastly, Williams’s question, “Which side are you on?”, is in response to the scenario in which the Gorgons are malevolent. But the case I imagine is that they are not that, but they’re just like you: they sincerely wish to better their species at the expense of another, less-morally-rational species. If that’s a possibility—i.e., if the threshold model is not 100% right and the admit-of-degrees model is correct (which seems right to me)—then it’s not clear what kind of moral argument you could offer to the Gorgons. Even worse, if the threshold model is not right, then not only do you not have a moral argument to offer, you morally *ought not* argue since their using humans in that case is—as with your colleagues with animals—the morally *right* thing to do. Yes, something may become “second nature” to us because it has been drilled into us by moral or cultural conditioning, but I hope you do not deny that humans also act instinctively much of the time and that it can be very difficult to tease out the instinct-driven behavior from what is conditioned — or reasoned. Nonhumans may tend to act more on instinct than (some) humans because they do not have the same cognitive abilities, but they still may be capable of reasoning to some extent and they do not lack intelligence or a certain degree of consciousness. May I recommend another book you might find interesting? It is INTELLIGENCE IN NATURE by Jeremy Narby. I do not think we disagree much on what we see animals do — we differ in our intentional stance and what the observed behavior implies in terms of mental states as well as their moral relevance. A dog saving a human may be seen as an act of heroism…. but only by a human. Even if acting by instinct, it is doubtful the dog will see in retrospect his action as morally commendable… nor any of his conspecifics will rush to congratulate him on the feat. I reject your characterization. First of all, I like most activists. I merely dislike those that, in their self-righteousness, profess violence as a valid method of social change. Second, I do not denigrate animals. Not at all. We simply have different views on what may be going on through animal minds compared to those of humans. When people perform “heroic” acts, they often say later that they did not give it a thought but just “instinctively” acted. The “instinct” they describe may have been based on prior moral reasoning, but perhaps not. Instances of nonhumans acting in a way that endangers themselves in order to help others is very well documented, and it crosses species lines. Reasoning probably has little to do with it. I can understand that some animal researchers may feel so plagued by certain animal activists (or people who represent themselves as such) that they have unfortunately developed a distaste for animal advocacy in any form, but is it fair to denigrate animals because you don’t like activists? If you didn’t like Mother Teresa (and indeed many people found her insufferable), would you take it out on the poor? … more than that. You are also ready to interpret such instances as demonstrating the existence of mental states characteristic of moral reasoning. Thus your use of words like “heroism”. What would the inmates of a maximum security prison do if they were buried in a mine shaft “with only some bottles of water and a handful of cans of food”? They would probably act more like chimps than the 33 Chilean miners did. There are demonstrable moral differences between humans. I do accept that there is a difference between the cognitive abilities of humans and nonhumans, but I categorically reject the notion that nonhuman animals are incapable of behaving in a way that goes against their own interests. A new quality that appears in a species has roots in attributes of earlier species. To state that there are qualities in Homo sapiens (especially moral qualities, to wit, a “soul”) that appear nowhere else in the chain of evolution is to hold essentially the same position as a creationist. Cooperation was the root of altruism, and even simple organisms cooperate. More complicated organisms display altruism. Many animals are capable of sympathy, devotion, generosity, and heroism, which probably grew out of altruism. Some species (for example, dogs and cats living in a home) are capable of altering their natural instinctive behavior to comply with norms of conduct established by others (in this case humans), which suggests how early humans might have moved from anarchy into a primitive society. Some animals display consciousness, in its most strict scientific definition (which is elevated as more species of animals show evidence of consciousness). That is not anthropomorphism; that is realism. The definition of what makes Homo sapiens so different from other animals (as if we were) has changed every time it is found that another species is able to do whatever humans were supposed to be so uniquely capable of (for example, tool use, followed by language, and now you are saying moral contemplation). Well, I find the process of evolution beautiful and uplifting to contemplate. Evolution is my “religion.” That Homo sapiens has the ability to evolve further–both intellectually and morally–is what keeps me optimistic, and it is the view that has been shared by social reformers throughout history–the very ones Bernard Williams would characterize as self-deceived, self-contemptuous, and self-loathing. I do not believe my second paragraph should be construed as a “strong reaffirmation of Williams’ quote.” Without some psychological coping mechanism, a social reformer does begin to lose hope in the face of so much suffering in the world and the difficulty of changing hearts, and even more so institutions. It is individually maladaptive to be more naturally sensitive or perceptive than others to wrongs that are being perpetrated, but it is vital for the evolution of the species that some humans have a heightened sensitivity to injustice. It never occurred to me that one day I would be lumped together with creationists! Yes, of course I accept evolution. Accepting a scientific demonstrable gap between the cognitive abilities of humans and other nonhuman species is certainly not against evolution (http://www.leecharleskelley.com/images/darwins_mistake.pdf) it is accepting its consequences. Yes, some nonhuman animals can display signs of cooperation and altruism — that is not true moral agency. Nonhuman animals are not able to behave according to societal rules that will clearly go against their own interests. If evolution is really your religion, you ought to consider that there might be much simpler explanations to the behavior you sometimes observe instead of declaring the result of mental states might just not be there — such as those implied by terms like heroism, generosity and empathy. Please, watch the Dan Dennett video. Here is a thought experiment. Bury 33 human miners alive with only some bottles of water and a handful of cans of food. What do you think will happen? Well… it is not really a thought experiment, as we know what actually happened — these Chilean miners shared the food and the water in an equitable manner and were all eventually rescued. What do you think 33 chimps would do in a similar situation? I don’t think it so simple to say that animals are amoral and humans are moral (or potentially moral). Nonhuman animals are demonstrably capable of altruism, sympathy, heroism and other admirable qualities, and no doubt it is from those positive traits we share with other animals that the concept of morality has evolved in our species. To “hate” one’s own species is pathological, but isn’t any form of hate pathological? By virtue of the greater human potential for morality, humans should learn to treat all beings with the highest moral consideration, including other humans of course. It is my experience that animal advocates begin their efforts with a sense of idealism and optimism, and at some point become profoundly sad when they learn how much terrible suffering humans cause animals in this world and how difficult it is to instill compassion in people who have become inured to cruelty. Then a psychological coping mechanism arises that allows them to continue their work, or else they self-destruct. A heightened sense of compassion can be painfully maladaptive. So anyone who wants humans to be better than they are is full of “self-hatred”? Does this apply to moral crusaders of the past who condemned such things as public executions or infanticide? There is a certain (hopefully continually increasing) percentage of people who are oriented towards conduct which might be described as exemplary of the Golden Rule, and a certain, smaller percentage that is oriented in a way that is perceived as sociopathic or psychopathic, and the vast majority acts according to social norms which are subject to change (for better or worse) at any time. That may seem a cynical view, but I think it is more scientific than pretending that people are basically good at heart. Your Rousseau-esque naivete might be informed by reading Malcom Gladwell’s TIPPING POINT or Steven Pinker’s THE BETTER ANGELS OF OUR NATURE. I think that human beings have evolved to have greater moral potential than other species, but that means that in addition to adhering to the Golden Rule in our relations with other people we should treat other species better than they treat each other or treat us–instead of worse, which is usually the case. People proclaim that they are morally superior to animals, but then they will use the behavior of certain animals to justify their own treatment of animals. “Why is it acceptable to kill and eat animals if there is other food available?” one might ask. The answer: “Because it is natural. After all, animals eat other animals.” Well some animals eat other animals. “Why is it acceptable to hunt wildlife for sport?” Because animals hunt. Why object to a bullfight? Because a cat may (seem to) torture a mouse before it is killed. The justifications for cruelty or indifference to animals are endless. And in many parts of the world, women have a status that is little better than that of animals and are treated accordingly. Why would anyone imagine that humans in space would treat sentient lifeforms on other planets better than they treat sentient lifeforms on this planet? That is illogical. Appealing to nature is not a valid argument to justify human behavior. As I said, and I think you must agree, non-human animals are amoral. It does not make any sense to seek moral guidance from animals (not from a lobster and not from an ape). A moral argument must be put forward in every case. Having a desire to improve ourselves in various ways, including our treatment of each other and other living beings, is not necessarily an indication of self-hate. Arguing that humans are a cancer to our planet, that people are intrinsically evil, that we ought to learn how to treat to each from non-human animals, and showing a higher moral concern for non-human life than to our fellow humans, are all indicative of hate for humanity in my opinion. Here is one clear example from Ingrid Newkirk — “Humans have grown like a cancer. We’re the biggest blight on the face of the earth”. I have met many animal activists that share some version of this sentiment. I guess this is a good example of what Williams refers to as self-hatred. I don’t believe most humans today are immoral or amoral. I think the vast majority of people are basically good and follow basic moral principles. Frankly, I cannot imagine how you go about interacting with the rest of the world if this is what you truly feel. We are not merely chimps with slightly better tools. Humans are the only ones to ask how is that we should treat other living beings. Like it or not we are the only species on Earth that asks such a question. I am sure you can agree on this simple fact. This does not entitle us to do as we please with other living beings. To the contrary, I think it is precisely such a recognition that creates a deep sense of responsibility towards the animals that depend on us. Moral communities are largely built around the reciprocal application of moral principles. You must accept that non-human animals do not understand such a concept. Thus, they cannot be members of a our moral community of equals. And once again, this does not mean we can do with them as we please. What about agreeing at the very least on the following? Given the barbarism with which humans treat other sentient species on earth––not to mention the way some humans still treat other humans in dark places of this world––why should a species with moral principles that is so advanced that it could be exploring space from a planet we cannot so far even conceive of reaching consider Homo sapiens to be a moral species operating on the principle of the Golden Rule? If the moral aliens were guided with something like the STAR TREK prime directive, they would leave us alone. If their mission was something like a cosmic moral crusade, they might seek to improve us. If they were amoral or simply functioning at the moral level of most humans today, they would seek to exploit us and our planet. Why wouldn’t they use us for invasive experiments or eat us or enslave us? They might perceive very little difference between us and other primates. We might be thought of as techno-chimps. It is my hope that before humans have the technology to travel to other inhabitable planets that we have begun to apply the Golden Rule to other sentient life on this planet, otherwise our arrival on other worlds would be a disaster for lifeforms that cannot defend themselves against us. It is ironic that we are searching for signs of intelligent life in space when we cannot even recognize other forms of intelligent life on earth. Not just other vertebrates, which some enlightened scientists now acknowledge are both sentient and sapient, but think of invertebrates such as the octopus or the lobster–which has a complex nervous system, social structure, finely honed navigational abilities, and possibly even empathy (lobsters have been observed leading smaller, weaker individuals claw-in-claw).